You guys!!! Remember my parents’ beach house? I have SO MUCH to catch you up on. It’s taken us most of this year to get the other rooms finalised to a point where they are ready to share. Like most people who are decorating, Mum and Dad got to a certain point where the furniture and basics were in place, and because it was liveable and comfortable, the pressure was off to “finish” it. 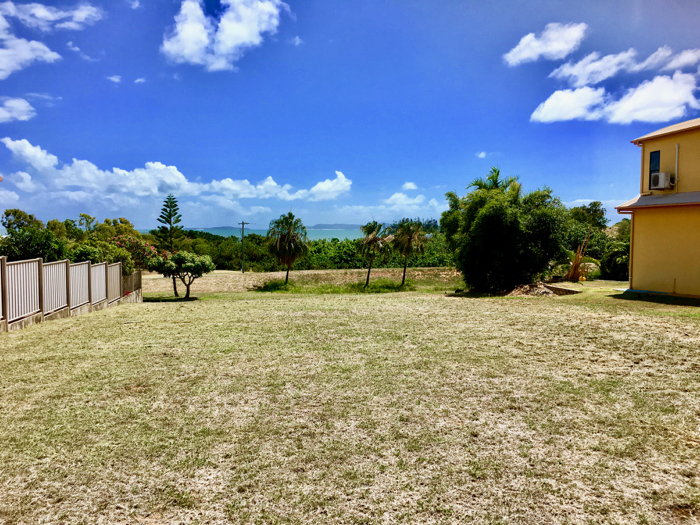 Mum and Dad’s block of land – before the build! We also had the issue that some key items were on backorder for MONTHS – like the gorgeous bar stools we ended up choosing for the kitchen. (Hint: they’re not the same ones we put in our original mood board! We changed!) So there were just a handful of really integral items missing in every room, even the rooms that were SO ALMOST FINISHED. 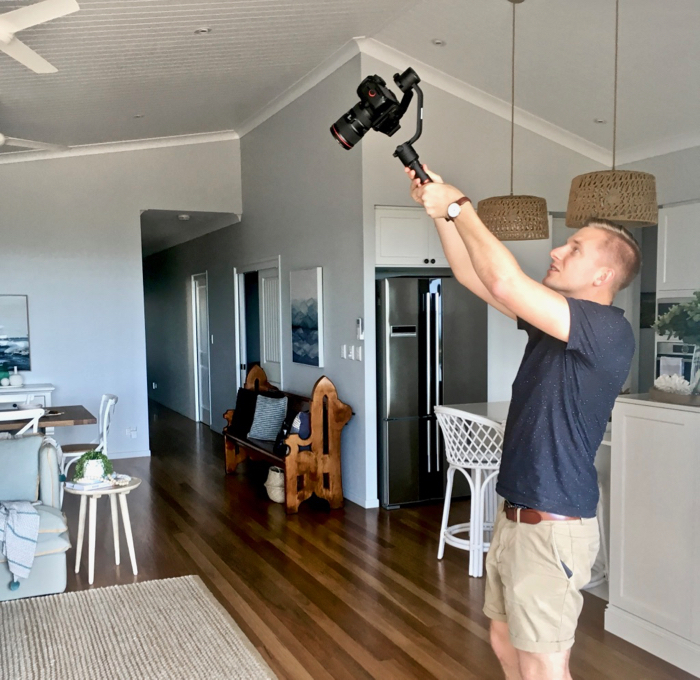 That’s why after my initial flurry of posts, things quietened down on the blog, and you haven’t heard about the beach house for a while – because for the longest time nothing has been quite ready to share. But now I am pleased to say we are FINALLY finished with the kitchen, the living and dining rooms, and the deck! What’s more, I have a complete VIDEO REVEAL coming your way soon for your viewing pleasure – the next best thing to seeing it in person! 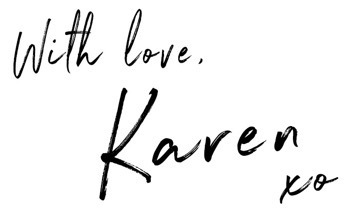 Okay, so I just gave you a little sneak peek! 😝Although to be cheeky I chose a shot where you can’t really see a whole lot…. he he! I know, I know, I’m a tease like that. While I’m waiting on video edits to come back, I wanted to catch you up to speed on our design plans for this open plan living area. I shared our kitchen mood board here, but I haven’t shared anything about the living or dining room yet. 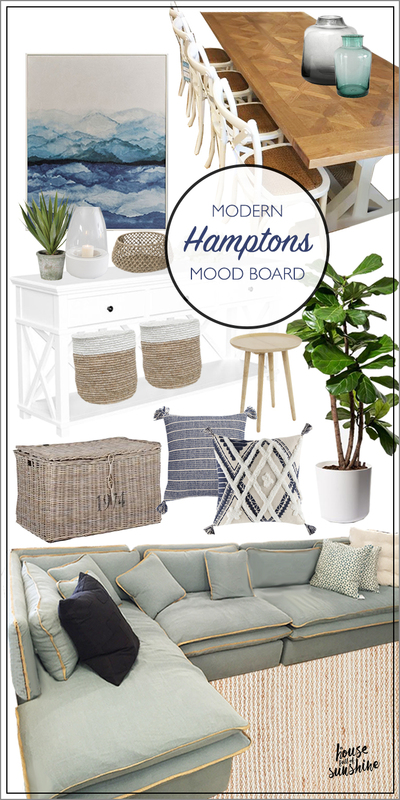 As I’ve talked about in previous posts, we were inspired by Hamptons style due to the fact that Mum and Dad’s house is directly opposite the beach. But they also didn’t want anything too formal or tailored, so we gave it a relaxed modern-coastal twist. We started with a lovely soft palette of muted grey, fresh white and soft duck egg blue. 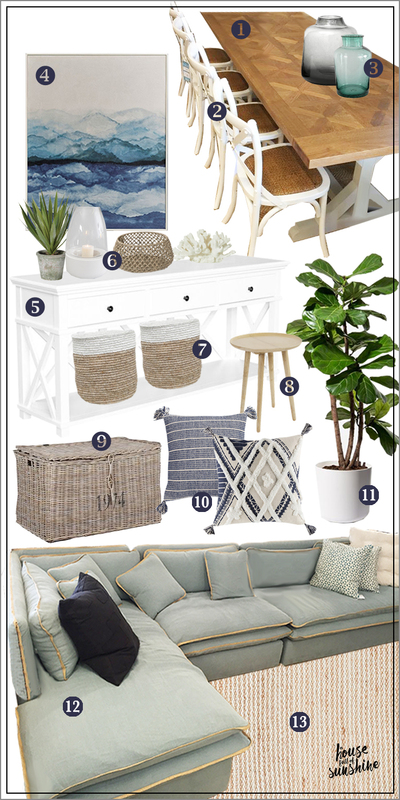 Because that’s a cool colour scheme (all those ocean tones) I made sure to warm it up with some hits of timber and natural woven materials like jute and rattan. Here’s our living/ dining mood board. 3 – Nothing says “coastal” to me like oversized glass vessels. We mixed smoky grey tones with blue for contrast. 4 – This artwork from Bed Bath ‘n Table was quite a cheap print on canvas, but the framing elevates it and makes it look special. Ocean tones for the win! 5 – This white buffet from Interiors Online is a perfect fit for a coastal room. Because the floors are timber, we didn’t want too much timber furniture. White is timeless, fresh and beachy, and because the buffet is open at the bottom, we finished it off with some oversized baskets for casual storage. 7 – These large seagrass baskets were sourced from Freedom Furniture. I love how the band of white helps tie everything together and echoes our theme of white + naturals. There are actually three on the buffet, but I only photoshopped two in there so you could see the pretty X detailing on the back of the console. 8 – This little oak side table from PillowTalk is modern and has a Scandi feel. The cool timber tones work perfectly with our coastal room. 9 – This large grey-washed wicker trunk is from La Maison. We got it to replace about three different baskets that were being used for toy storage beside the couch. It has cut the visual clutter, and it also makes a fantastic side table with heaps of coastal character. 10 – The cushions were from Pillow Talk. As my long-time readers know, I have a slight cushion obsession and would have loved to do something a bit more designer and artisinal like hand-blocked indigo prints on linen… and while I pinned the heck out of those sort of options on the private Pinterest board I set up for Mum and Dad, they weren’t keen on the $100+ price tag for some reason. Ha!! I know, they are the normal ones, not me. Don’t judge. For some women it’s shoes. For me it’s homewares. Anyhow, these do the trick, and the fringed cushion brings in a bit of a cool boho vibe. 12 – THE COUCH. How did it take me this long to talk about the couch? It was a local find from HB&Co and it was purchased by Mum and Dad before they even moved up here. They’d bought their block of land but the house building hadn’t started yet, so the couch stayed in storage for a few months. It was literally the first thing we bought for this room, and was our jumping off point for everything else. The covers are linen in the most gorgeous duck-egg blue/green, with a little jute edging that makes my designer heart sing because it echoes the rest of our natural fibres so beautifully. Also, it is THE MOST COMFORTABLE couch in the history of ever. The seat cushions are filled with memory foam and the backs are stuffed with down, so you sink into all that pillowy softness and may never get up again. 13 – Last but not least, our living room rug was from Armadillo & Co. It’s the Kalahari Weave in chalk, and it’s made from a blend of jute and wool for softness and ultimate indestructibility. Hopefully that gives you a bit of a taste of what’s in store! Can you picture it yet? So what’s next? We’ve been working on a few finishing details for the master bedroom and main bathroom, and they are both ALMOST ready to show you. After that we’ll be installing a gallery wall in the hallway and finishing off our entry and laundry. Everything is like 90% done, so you’re going to have a whole heap of reveals coming your way over the next couple of months! And there is nothing I find quite so much fun as a good room reveal. How about you? Can’t wait to share this gorgeous kitchen/ dining/ living area with you VERY soon! Until then, wishing you a house full of sunshine.